Ever wondered what it would be like to dive off a 14-storey building? Ok, that sounds a little suicidal, but that’s the kind of sensation you get when you’re sliding down Insano, the highest water slide in the world. Part of a water park near the Brazilian city of Fortaleza, Insano is known as one of the most thrilling water park attractions in the world. 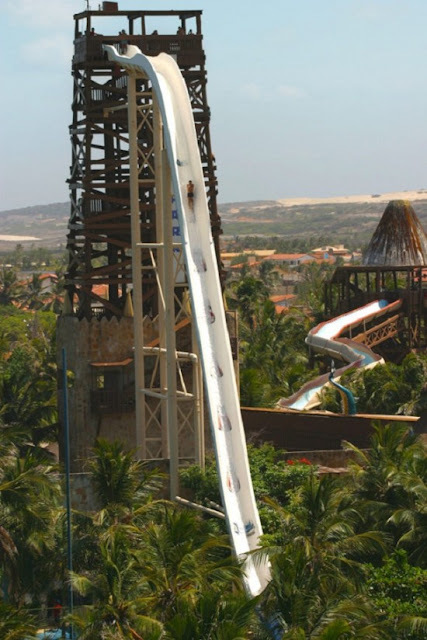 Constructed in 1989, it still holds the record for the highest water slide on Earth, at 41 meters high. That’s as tall as a 14-storey building, in case you were wondering. What makes Insano “the most extreme equipment of this type on the planet” (according to the beach park’s official site) is the very steep slide that really lets gravity do its number on anyone crazy enough to try it. Apparently, the whole decent takes just 4 to 5 seconds but during that time you can reach speeds of up to 105 km/h. That’s as fast as a Ferrari. 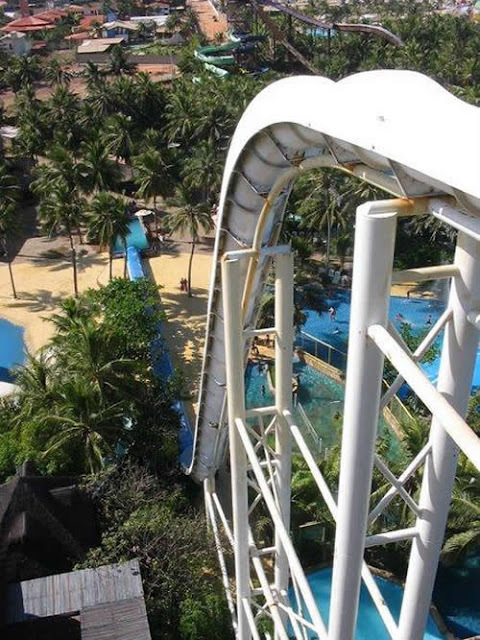 Luckily, there’s a nice big pool at the bottom to bring you to a halt, but I wonder what would happen if you ran before sliding… This thing looks so steep that you might actually miss the slide and jump to your death. Everyone commenting on photos and videos of Insano seems to want to try sliding on it themselves, but I can barely stand to watch others doing it. For once, I think I might NOT be the one with a problem. Oh and if you’re thinking about all the crazy positions you’d like to slide off Insano, you should know they only allow the classic water slide position, to avoid any injuries. Also, people with special needs, pregnant women and children under 1.40 aren’t allowed to use it.